Did you sit down at the dining table around the 27th December to write your thank you letters? I did. I can visualize it now. Me at the dinning table, my mum in the kitchen, something tempting on the TV in the sitting room, but I HAD to write the letters, and there was no playing until they had been written. Out would come some notelets – you may know the kind, a picture on the front with blank pages in the middle. The perfect size to write a thank you letter. The notelets could well have been one of my Christmas presents (you see my Mum didn’t miss an opportunity!). Maybe a picture of some flowers or an animal would decorate them. I only really had to write two proper thank you’s – I don’t have a large family. One would be to my grandparents in North Wales the other to my Great Aunt and Uncle a few miles away in Cheshire. Thank you very much for the lovely jumper/cardigan/tank-top you knitted me. I’ll be wearing it to school when I go back after the holidays (you see I got school jumpers for Christmas and then had to say my thank you’s – humph!). Thank you very much for the selection box (remember those sock shaped selection packs? The one with maybe 6 chocolate bars on, which had string/mesh to keep the chocolates in? ), I really like the chocolate (Chocolate and sweets were a MAJOR treat) and I’ve eaten 2 already. We went for a walk yesterday and it was nice and sunny. Insert any other random “news” here. Those thank you letters seemed to take FOREVER to write. But in truth were pretty short and invariably the same year on year! I’d like to thank my fellow bloggers, could I call you friends now? I think so, for awards they have given me over the last few months. You see this thank you letter writer is VERY tardy. My excuse? I wasn’t sure what to write in return, nor was I sure who else to pass the awards onto. I’m still not sure now, but I’ll give it a go. Karen for her positivity and being one of the first, Farmy for her pleasurable company and high humour, John at the Bartolini Kitchens for his encouragement and great take on life , Marie over at My Little Corner Of Rhode Island, simply a fabulous gardener, Stacey from Down to Earth Digs and Goldcoast for their inquisitiveness and generosity of time, oh and they are great gardener’s too! And now I’ve written this list I feel a bit mean as there are only 6 of you listed, and it doesn’t include EVERYONE who reads this blog! Karen at Backroadjournal, Linda from OrangeBee and Celi of TheKitchenGarden have all nominated me for the Liebster Award. This goes to 5 bloggers who you want to recognise as up and coming bloggers with less than 200 followers. You link to who award you, list your 5 blogs and contact them on their blog. Now and Gwen entertains me with her garden life, the trials and tribulations of Mr Courgette and the rest of the vegetable family. Congratulations, Claire, on your well-deserved awards. I’ve a feeling that you’ll see more of them in 2012. And, thank you for the nomination and your kind words that accompanied it. I’m honored for both the award and the company with which I was nominated. Great picture of the toast du soleil! Thank you John, you are a well deserved recipient, and I look forward to seeing who you pass it on to ! Thank you for nominating me for a Leibster Award! I can’t wait to check out the other blogs you linked to. I hope you have a very wonderful New Year! It’s a pleasure to nominate you 🙂 I hope you have a great gardening new year too ! It’s fun to discover new blogs isn’t it – there’s so much out there to share. ps – I never kid around when it comes to champagne 🙂 and there you go, a little refill…… rose ok for for you?! Hi Claire, Thank you so nuch for the award. I am happy that I was one of the first to comment on your blog as I have always enjoyed your posts. Thank you for the toast…Rose Champagne is my favorite. 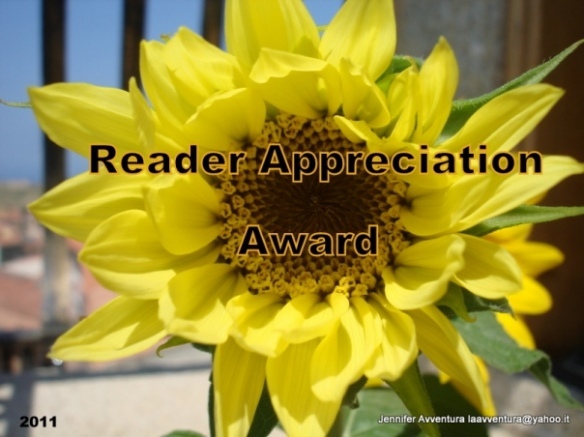 This is a wonderful idea for an award – after all, where would we be without our readers? Much love and luck for the coming year! Congratulations! Much deserved! I very much enjoy your photos and musings. So glad I “found” your blog. I’m looking forward to checking out the blogs you have thanked or recommended. 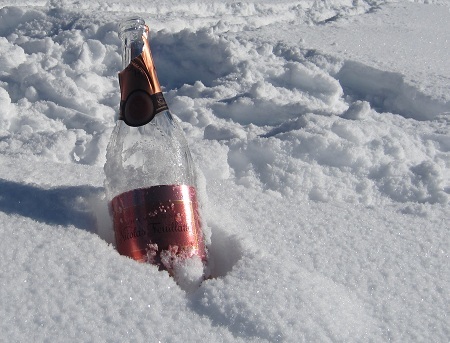 I love your photo of the champagne in the snow – it’s so long since I’ve seen snow! Cpngrats on the awards! And the memories you bought back with those thank you letters. I had to write them too to Great Aunt Joan (St Leonard´s on Sea – we have a long family connection there!) and my great grandmother and a few relatives in North Wales…good lord, maybe we´re related?! Thank you 🙂 It’s a bit of fun isn’t it, an dthe bonus is to connect with some “new” people. I’m pleased to have struck a chord with the thank you letters! Thank you for nominating me, it’s a gorgeous photo. 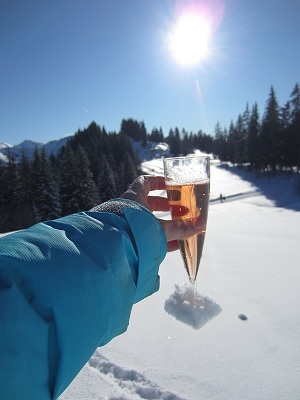 Snow and champagne what a terrific mix. Congratulations Claire! and a huge thank you for even thinking of my little blog! I’m honored! Your were the first person to find my blog, and I have had so much fun with this creative outlet. I am catching up on reading my favorite blogs…… this one was a message close to my heart. My 82 year old(young) mother is one of the best sending out those handwritten thank you notes. I always enjoy seeing her beautiful cursive script…. I think handwriting is becoming a lost art. In return I have encouraged my children to write, really write, not an email or a text message, but a hand written note. When I travel out to California for business I always make time to visit her. She delights in showing me the latest note from a grandchild, you can see a mix of sparkle and wetness in her eyes as she proudly shows those precious notes. So, – pretend this is a handwritten note – I appreciate your postings in so many ways…you are clever, insightful, full of great cooking tidbits and so complimentary. Thank you….and I do hope that you continue your postings. Have an incredible 2012! Congratulations on your awards, Claire. Enjoy them. Thank you – it’s a lot of fun is this blogging!